One of the most popular Vaishnava Saints, Vallabhacharya is the founder of the Pushtimarg or Pushti Sect. In 2019, the date of Vallabhacharya Jayanti is February 5. The jayanti is observed on the Magh Shukla Paksha Pratipada. Vallabhacharya taught monism or the Shuddhadvaita School of philosophy and it stresses that Shri Krishna is responsible for all animate and inanimate and only through His blessings can a human being attain Moksha. Worshipping Lord Krishna in the form of Shrinathji was introduced by Saint Vallabha. Legend has it that Vallabhacharya during one of his journeys to North West of India noticed a strange phenomenon near Mount Govardhan. There he saw a cow daily going to a particular spot in the mountain and shedding milk. Vallabhacharya asked people to dig the place and there they found the idol of Shree Nathji. It is said that Lord Krishna had given darshan to Vallabhacharya in the form of Shree Nathji and hugged him. Some people consider Vallabhacharya as an incarnation of Lord Agni, the fire god. Vallabha laid great stress on Pushti (grace) and Bhakti (devotion). The followers of Vallabhacharya worship Bala Krishna, young Krishna. 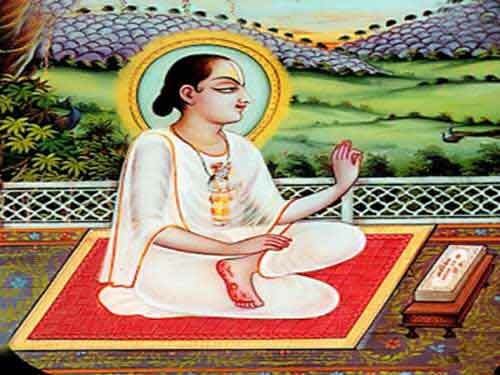 The important literary works of Vallabhacharya based on the principles of Pushtimarg include Vyasa Sutra Bhashya, Jaimini Sutra Bhasya, Bhagavata Tika Subodhini, Pushti Pravala Maryada and Siddhanta Rahasya. Vallabhacharya wrote in both Sanskrit and Brij language. Ramghat in Haridwar is of great importance to the followers of Vallabhacharya as he is believed to have meditated here.